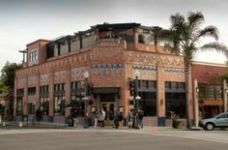 Built in 1928, this elegant brick building combines designs of Spanish Colonial Revival with influences of zig-zag modern, most visible in the glazed tile and decorative brickwork. The hand-stenciled ceilings and wood paneling are reminiscent of Hearst Castle. The murals, painted by artist Norman Kennedy, depict early life at Ventura’s Mission.